In this episode, we get amped up for a trailer and summary describing exactly what we expect to happen. But also for an early review of the Determination dub and our chance to join the show’s cast on a panel! It’s strange to be coming off a tri. movie that felt like a step back. Loss delivered plenty of good moments and explained a ton, but the way it stretched out unproductive moments and failed to bring the best out of some the most interesting bits made it something of a letdown. With only two movies left, there’s no more room to be sloppy. Thankfully, Loss was the first movie that answered more questions than it asked and set up Symbiosis nicely. So nicely, in fact, that there are few surprises in either the summary or the trailer. Everything we’ve seen so far is either a logical progression of the story or previously foreshadowed. 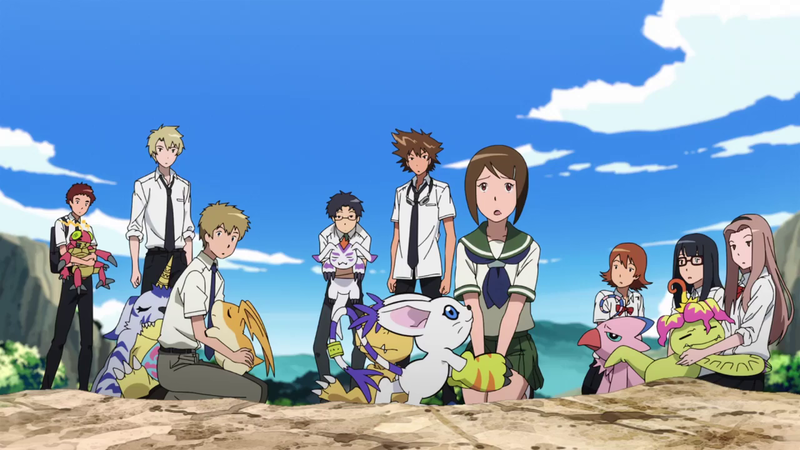 Meicoomon’s capacity for destruction reaches a critical mass, the kids have to make hard choices about destroying one of their own, Digimon start to invade the real world en masse and cause a panic, and Homeostasis (potentially acting through Hikari) starts acting out in a way the kids may not support. This has all been simmering for four movies now. Maybe that’s why it’s easier to be excited for it than the previous movie. The reboot was such a dramatic swerve that it was hard to get a feel for what Loss was really going to be about. It’s not like the main plot was abandoned: we still learned plenty about Maki’s history and intentions, Hackmon’s role, and the apparent evil force at work. But the main story, and even the Digital World setting, set it apart from the previous films in a way that could ultimately make certain elements feel unnecessary. For a series with only six movies, that’s disappointing. The trailer for Symbiosis feels like everything’s right back on target. It could still go wrong, of course, especially in the much-anticipated Hikari chapter. The trailer suggests Meiko’s side of things is the natural climax to the story she’s built up, so no worries there. Hikari’s more of a mystery, especially since she’s never had a proper story arc. Even in the few Zero Two episodes focusing on her, most of the attention was on the way she’s susceptible to corrupting influences and the way others are quick to rush to her aid. She hasn’t been a dominant presence in tri. either, and it would do well to break her down properly. Especially if she can resolve her own problems in the same way Sora finally got the chance to in Loss. As for other site stuff on the horizon, one of my convention friends attending Anime Expo was nice enough to pick me up a copy of the Determination Blu-Ray (if you haven't ordered yet, you can do so through the link and support the site!). That means once I’m able to get it from her, I’ll be able to review the dub of the second movie before its official release date! You can look forward to that in a couple weeks. The really cool news is I’ll be joining Digimon voice actors and directors this summer at two of my local conventions! At Geek.Kon in Madison, Wisc. 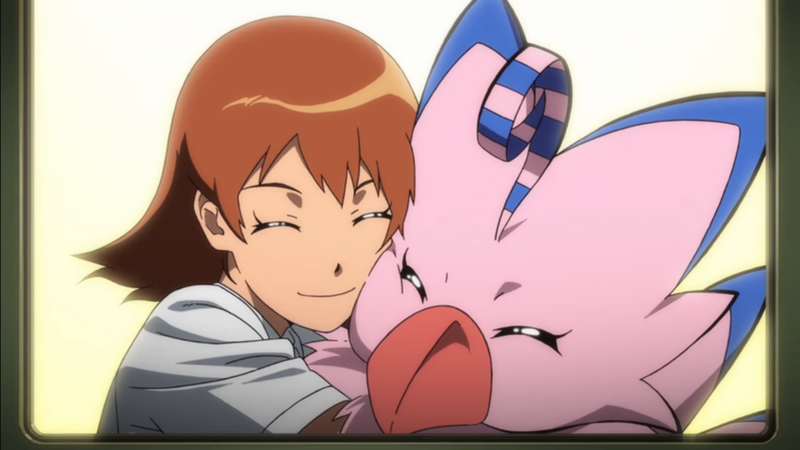 this August, Jeff Nimoy and I will talk Digimon for an hour (Robert Axelrod, voice of Wizardmon and Armadillomon, is also appearing). The really exciting one is at Kitsune Kon in Green Bay in one week. Check out this roster: Colleen O’Shaugnessey (Sora, Yoshi, Angie), Derek Stephen Prince (Ken, Veemon, too many more to count), Paul St. Peter (Wormmon, Leomon), Brian Beacock (Takato, Bokomon, Data Squad Agumon), and Steve Blum (Guilmon, Yamaki, BlackWargreymon, JP). Hour one will be talking with the guests, while hour two will be a broader discussion of the franchise. Feel free to comment if you have any questions you’d like to see asked, and follow my social media for the rundown (and possibly video) of the panel. Back to the well again (and still better than I Wish). It’s an oddly peppy choice for a movie with such a dark resolution (and it’s not like any of the middle episodes end on cheerful notes), but it does have some fight to it which is a good tone to carry into Symbiosis. Still not much for animation, but at least the images are cute. Labels: adventure, ending, not an episode, tri.